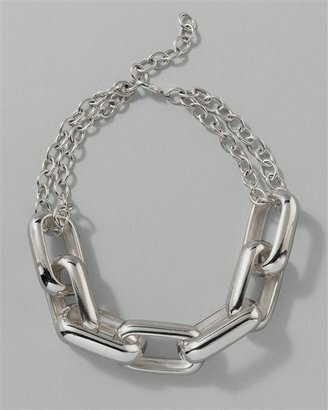 As seen on the Fall 09 runways, this Michael Kors oversized chain link necklace costs $700 at Neiman Marcus. If you've been lusting after the original for months, then you will love this find (I was so excited when I found it! ): Get the same dramatic look with Chico's chunky Constannza chain necklace, on sale for $47.25. Michael Kors also created a gunmetal version of this necklace, which also sells for $700. If you prefer this finish, try getting the look for less with this Charlotte Russe thick chain necklace, just $11.50. You can click any image to purchase. Toss on a cozy yet stylish sweaterdress when you want to look nice—but don't want to freeze. If you're worried about bulk, avoid chunky knits and turtlenecks, and go for v-necks and 3/4 length sleeve styles. Any neutral will be a versatile choice, but a rich purple, blue or red will make things more fun. I prefer styles that are fitted, not clingy, which fall just above the knee so you're not overwhelmed by your dress. Add solid or textured tights, ankle booties or tall boots, and you're good to go! If you want to dress it up even more, add a cool belt, pendant necklace or other jewelry. You can find sweaterdresses for cheap at many stores, but the best selection online right now has to be Victoria's Secret. They have dozens of styles including sale items as low as $19.99. Browse the amazing selection below to get some ideas! This classic Burberry Brit Quilted Jacket is available in vintage rose, white or black and sells for $395 at Nordstrom.com. These jackets were everywhere back in 2004, even garnering a spot on Oprah's Favorite Things list for holiday gifts. If you like the look or know someone who does, get it for less with the Land's End Dory Jacket, available in 9 colors on sale now for just $29.50. Click the image to purchase.